My son loves Big Trucks! 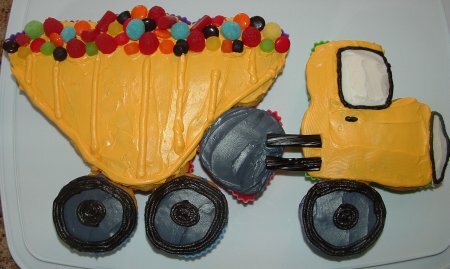 My daughter and I made him a Dump Truck Cake as a surprise! After moving to a new home, my son is obsessed with all the construction vehicles that are building the houses around our new home. It is so cute to see how excited he gets when he hears a truck coming. He runs to the front door and sits on his little red chair to watch the trucks through the window. 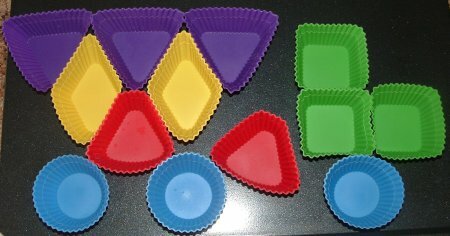 We used the Wilton cupcake shapes to create the cake shape from the pack “Puzzle-a-Cake Set”. First, we placed the shapes on a cookie sheet to form the shape of the dump truck. Then we mixed up a regular cake batter. We made a yellow cake mix because the icing was going to be yellow as well. Next, we filled the cup cake forms up to the fill line (a little line on the inside of the cup cake form). After baking the cupcakes, we pushed the cake formation onto a cooling rack to dry. While cooking the batter rose so the cake is all one on top and on the bottom it is like cupcakes. Once the cake was cooled we iced the cake. I used regular store bought butter cream icing. We also used the Wilton coloring to die the icing all the different colors necessary for the cake (Wilton 12 Icing Colors Set). I placed some of the regular icing into a bowl and with a tooth pick dotted in some of the die to create the ideal colors. I used a spatula to put the icing on the cake and then to add some detail I piped on the edging using the Wilton #1A tip and 5 tip. After the icing was completed my daughter and I had a great time adding a mixture of candy to the top of the dump truck. The candy really made the truck come alive. We had earlier gone to our local Bulk Barn and selected an assortment of candy that had more boyish colors (reds, blues, yellows, etc.). The best part of the experience was to see my son's face light up when we showed him his Dump Truck Cake. I knew we wanted to make him a construction cake and I think this was a great choice creating this dump truck cake. Our Construction Deluxe Party Box includes everything you need to throw the perfect party for your little one and 7 guests! Contents include full tableware for 8, a variety of Construction party decorations, and birthday candles.